Despite all its faults, Forever Evil #4 ended at a really major cliffhanger moment that had me cheering, almost. It shouldn’t be a surprise, looking at this cover for Justice League #26, what that cliffhanger might have been. And it shouldn’t be a surprise either that I was rather pumped to be reading this issue. Turns out that, in keeping with the weird tradition of all the Forever Evil event covers, the script in this issue has absolutely zero to do with the cover to this issue. Now that should not have been a surprise to me. This is terrible, terrible marketing and I don’t know what the hell DC is thinking, putting out covers that have jack-all to do with the content. So, moving on from that repetitive criticism and on to the story. The first origin story we see is that of the Earth 3 Hal Jordan, aka Power Ring, a cowardly and inept member of the Crime Syndicate. 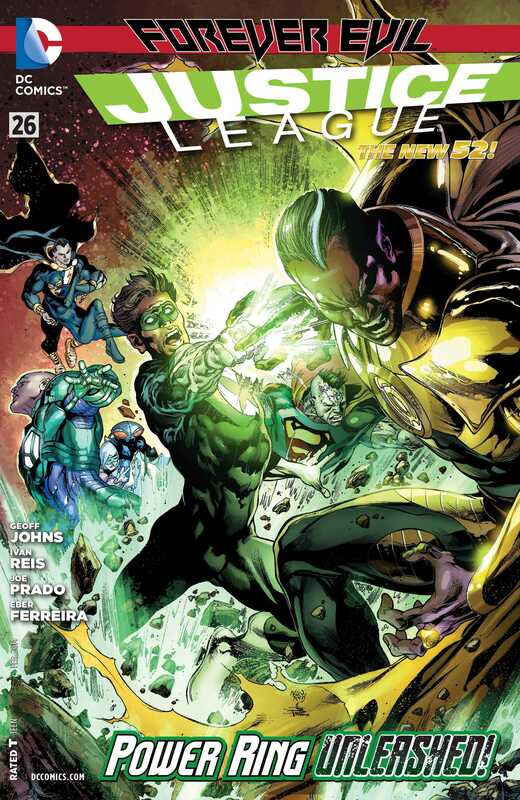 Geoff Johns and Ivan Reis lavish a lot of attention on this part of the script and we get a very, very interesting connect between Earth 3 and the events of Geoff Johns’ third arc on the rebooted Green Lantern for New 52, Wrath of the First Lantern. It made for some intriguing story and I’d like to know more about it, but I suspect we won’t see anything like this again. The portrayal of the character is pretty spot on and it fits with the Earth 3 evil theme. Then, in quick succession we get the origins of the other Crime Syndicate members, all of them, barring Superwoman. Grid, who is the narrator of this issue, wonders why her origin files were deleted from the system, and in the context of his drive to be able to feel something, to become emotional, he concludes that he would be suspicious. The other origin stories, including that of Grid (such as it is) are basically cliff notes versions and they explain how these characters came to be who they are. I particularly enjoyed the criminal thrill-seeker version of Johnny Quick and Atomica, though Deathstorm’s origin was rather luckustre and over far, far too quick. Throughout, Grid proves to be an interesting character, but his portrayal was too on the nose for me. It felt as if I was reading about Lore from Star Trek, Data’s “evil” brother and his quest for emotions, rather than Grid as a character in his own right. And the mystery about the CSA’s masked prisoner continues in this issue, something that has gotten extremely irritating of late since the script continues to dance around that subplot. Its a lingering plot that is dragged on and on in each issue without going anywhere and I’m not sure what Johns intends to do here. Ivan Reis as the penciller turns in a really great looking issue. His Hal Jordan and Abin Sur are really good, as are some of the big splash pages. Hands down Ivan Reis is one of hte best pencillers working for DC right now and this is one of his best issues. The origin tale of Johnny Quick and Atomica, in which we also get to see the Earth 3 version of Leonard Snart and Mick, who are both cops in this alternate world but on Earth 1 are the villains Captain Cold and Heatwave of the Rogues. In terms of expressions and body language, this part of the script is really good. Andy Lanning and Rob Hunter are the inkers on this issue, with Rod Reis, Tomeu Morey and Tony Avina serving as the colourists. In general, the inkers and colourists both do a really good job and I have no complaints at all about the artwork here, aside from that one panel where the masked prisoner smiles through the mash, which comes across as weird. Overall, the story suffers from a lack of plot progression but as a character study it is good enough. More Justice League: #1-6, #7-12, #13-15, #22-23, #23.1, #23.2, #23.4, #24, #25. Posted on December 27, 2013, in Comics Reviews, Review Central and tagged Abin Sur, Alfred Pennyworth, Comics, Comics Review, Crime Syndicate, Crime Syndicate of America, Cyborg, Earth 3, Evil, Forever Evil, Geoff Johns, Gotham, Grid, Hal Jordan, Johnny Quick, Justice League, New 52, Nightwing, Power Ring, Review, Review Central, Richard Grayson, Rod Reis, Superheroes, Supervillains, Ultraman. Bookmark the permalink. 7 Comments.